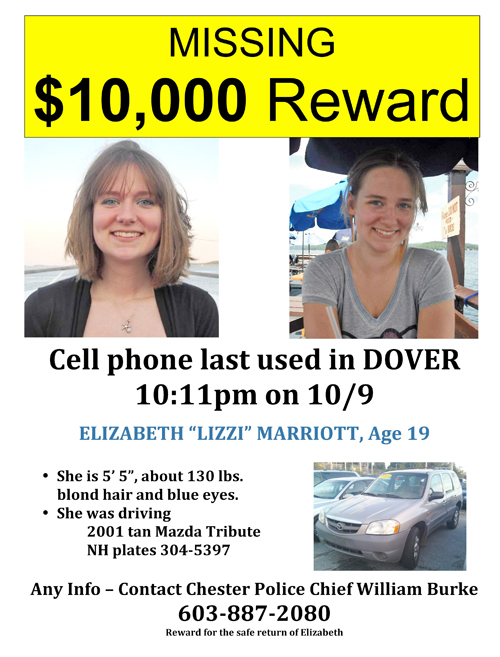 Elizabeth 'Lizzi' Marriott attended a class, and then planned to visit friends in Dover, N.H.
DOVER, N.H. – Searchers combed seacoast communities Friday for a 19-year-old University of New Hampshire student who disappeared after she made plans to visit friends earlier this week. Senior Assistant Attorney General Jane Young said investigators searched for Elizabeth “Lizzi” Marriott “from the sea, land and sky” and continued to hold out hope of finding her alive. Young said a bulletin was broadcast to police nationwide with Marriott’s description and that of the car she was driving — a tan 2001 Mazda Tribute. The family is offering a $10,000 reward for information leading to her safe return. “We are not losing hope in this case,” Young said. Young said investigators are not ruling out anything, including the possibility that Marriott’s car went off the road or foul play. Young also said investigators know the identities of the friends Marriott was planning to meet and have contacted them. Family members and friends blanketed the Dover area Friday with colored flyers bearing two photos of her and the statement that her cellphone was last used in Dover at 10:11 p.m. Tuesday. Marriott attended a class at the university Tuesday night and made plans to visit friends in Dover. Lizzi Marriott’s grandmother, Susan Marriott, was tending the phone at the Chester, N.H., home where her granddaughter lives while other family members were out handing out fliers and searching for her. “I’m just holding down the fort here in case a call comes from her, which would be such a godsend,” Susan Marriott said. She said the FBI and other investigators were at the house for much of the day interviewing family members. Lizzi Marriott is a 2011 graduate of Westborough High School in Massachusetts. She lives with an aunt in Chester and commutes to the Durham campus. The Chester Police Department, where the missing person report was filed, is serving as headquarters for the investigation. Young, who heads her office’s criminal bureau, was in Chester on Friday to help marshal resources and assist in the investigation. She also supervises all homicide investigations for the state. Marriott’s car bears the New Hampshire plate number 304-5397. Investigators have not located her car. Marriott is described as 5-foot-5, 130 pounds, with blond hair and blue eyes. Young asked that anyone who has information that could help in the case to call state police at 603-271-3636.